← Our Scooter Dragonet is eating fish pellets! When we had Emerald Crabs, they were great at decimating hair algae, which we are currently having a problem with. Since we no longer have Emerald Crabs (you can read about catching a crab here), we decided to take a trip to our LFS to see if they could recommend anything that would help keep it under control. What we decided on were Mexican Turbo snails. 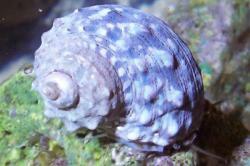 The reason we chose these snails, is because they are able to eat long hair algae. We have other snails in the tank, and have seen them eat algae, but not long strands of hair algae. These Mexican Turbo snails are quite large, most more than 2 inches wide, and within a week had the hair algae under control. You can watch one eating in the video below. They have what is refereed to as a “trap door”, which seals them in their shell. You can watch a video below of one deciding whether it is safe to come out or not. After only a week, we took 5 of them back (leaving one in the tank to help out with some remaining hair algae), and received credit towards our next purchase.